Measuring the positions and motions of more than a billion stars, ESA's Gaia mission will refine our knowledge about our place in the Universe, providing the best ever star chart of our Milky Way and its neighboring galaxies. One of the nearest galaxies to our Galaxy is the Large Magellanic Cloud (LMC), located around 166 000 light-years away and visible to the naked eye at intermediate and southern latitudes. With a mass roughly equivalent to ten billion times the mass of our Sun – about one tenth of the Milky Way – the LMC is home to an intense star-forming activity, forming stars five time faster than in our Galaxy. Different aspects of the galaxy's stellar population are depicted in these two images, based on data collected by the Gaia satellite during its first 14 months of operations. The view on the left, compiled by mapping the total density of stars detected by Gaia in each pixel of the image, shows the large-scale distribution of stars in the LMC, delineating the extent of the spiral arms. The image is peppered with bright dots – these are faint clusters of stars. A series of diagonal stripes, visible along the central thick structure, or bar, are an artifact caused by Gaia's scanning procedure. These will gradually decrease as more data are gathered throughout the lifetime of the mission. 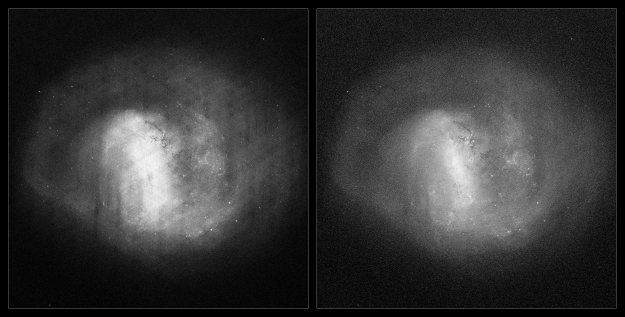 On the right, a different image provides a complementary view that reveals other aspects of this galaxy and its stars. Created by mapping the total amount of radiation, or flux, recorded per pixel by Gaia, this image is dominated by the brightest, most massive stars, which greatly outshine their fainter, lower-mass counterparts. In this view, the bar of the LMC is more clearly delineated, alongside individual regions of star formation like the sparkling 30 Doradus, visible just above the center of the galaxy. 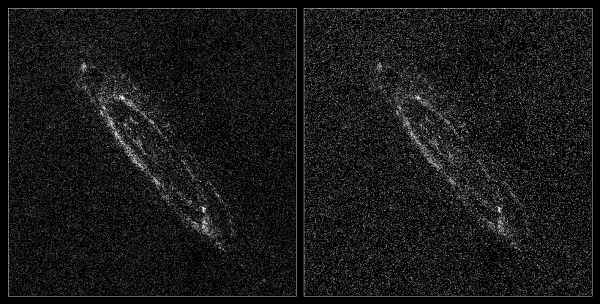 The images below, also obtained using data from the first 14 months of Gaia science operations, depict two nearby spiral galaxies: Andromeda (also known as M31), which is slightly more massive than the Milky Way and, at roughly 2.5 million light-years away, the largest galaxy in our vicinity; and its neighbor, the Triangulum galaxy (also known as M33) home to some fifty billion stars and located about 2.8 million light-years away. 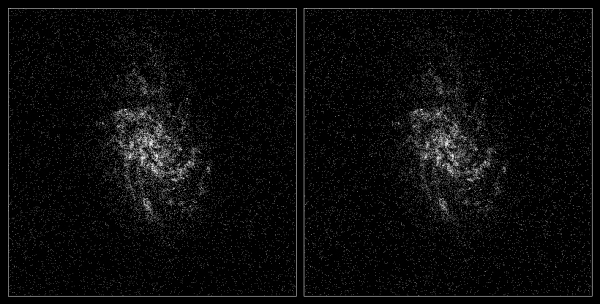 As in the case of the LMC, the image on the left is based on the total density of stars, and shows where stars of all types are located, while the image on the right is based on the flux and mainly depicts the bright end of the stellar population of each galaxy, tracing out the regions of most intense star formation. The first batch of Gaia data, released in 2016 and based on 14 months of science operations, contained the position and brightness of more than one billion stars. Most of these stars are located in the Milky Way, but a good fraction are extragalactic, with around ten million belonging to the LMC. For all these stars and more, the second release of Gaia data – planned for April 2018 – will also contain measurements of their parallax, which quantifies a star's distance from us, and of their motion across the sky. Astronomers are eagerly awaiting this unprecedented data set to delve into the present and past mysteries of our Galaxy and its neighbors. By analyzing the motions of individual stars in external galaxies like the LMC, Andromeda, or Triangulum, it will be possible to learn more about the overall rotation of stars within these galaxies, as well as the orbit of the galaxies themselves in the swarm they are part of, known as the Local Group. In the case of the LMC, a team of astronomers have already attempted to do so by using a subset of data from the first Gaia release, the Tycho–Gaia Astrometric Solution (TGAS), for which parallaxes and proper motions had also been provided by combining the new data with those from ESA's first astrometry mission, Hipparcos. In the TGAS data set, consisting of two million stars, they identified 29 stars in the LMC with good measurements of proper motions and used them to estimate the rotation of the galaxy, providing a taster of the studies that will become possible with future releases of Gaia data. Observations of the LMC and its neighbor, the Small Magellanic Cloud (SMC), with Gaia are extremely important also for studying variable stars like Cepheids and RR Lyrae. These stars can be used as indicators of cosmic distances in galaxies beyond our own as long as they are first calibrated in a 'local' laboratory, such as the LMC and SMC, where it is possible to obtain a more direct estimate of their distance using parallax determined with Gaia. Astronomers in the Gaia Data Processing and Analysis Consortium, or DPAC, tested this method on hundreds of LMC variable stars from the TGAS sample as part of the validation of the data from the first release. Their results, which are promising even though preliminary, are an exciting example of the rich scientific harvest that will be possible with future releases of the data that are being gathered by Gaia.